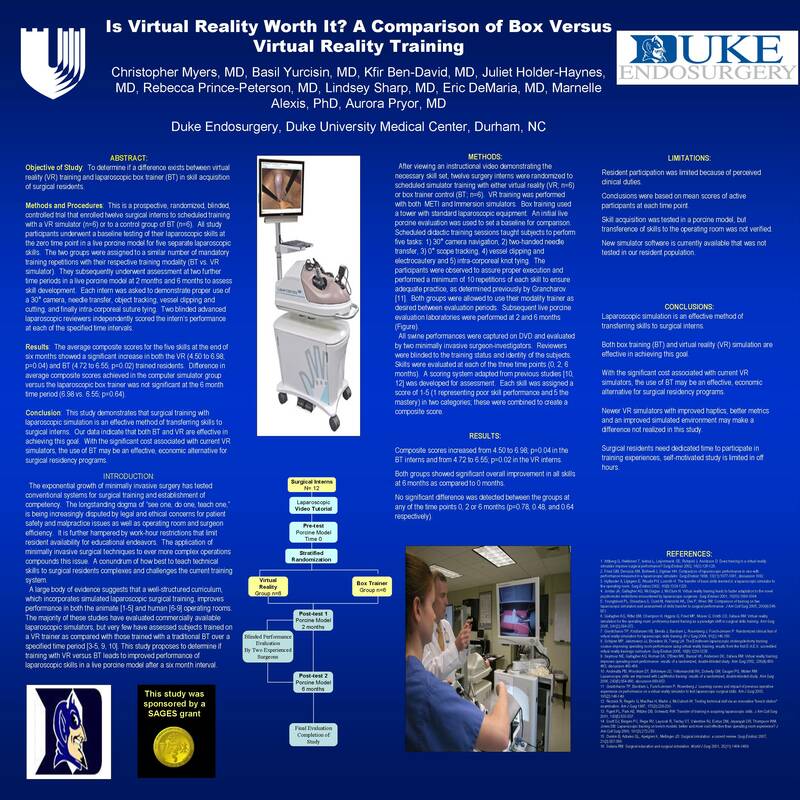 Objective of the Study: To determine if a difference exists between virtual reality (VR) training and laparoscopic box trainer (BT) in skill acquisition of surgical residents. Methods and Procedures: This is a prospective, randomized, blinded, controlled trial that enrolled twelve surgical interns to scheduled training with a VR simulator (n=6) or to a control group of BT (n=6). All study participants underwent a baseline testing of their laparoscopic skills at the zero time point in a live porcine model for five separate laparoscopic skills. The two groups were assigned to a similar number of mandatory training repetitions with their respective training modality (BT vs. VR simulator). They subsequently underwent assessment at two further time periods in a live porcine model at 2 months and 6 months to assess skill development. Each intern was asked to demonstrate proper use of a 30° camera, needle transfer, object tracking, vessel clipping and cutting, and finally intra-corporeal suture tying. Two blinded reviewers independently scored the intern’s performance at each of the specified time intervals. Conclusion: This study demonstrates that surgical training with laparoscopic simulation is an effective method of transferring skills to surgical interns. This study indicates that both BT and VR are effective in achieving this goal. With the significant cost associated with current VR simulators, the use of BT may be an effective, economic alternative for surgical residency programs.